An ingenious marketing campaign for Nivea’s line of sunscreen products has been causing quite a stir in the marketing community with an innovative advert. 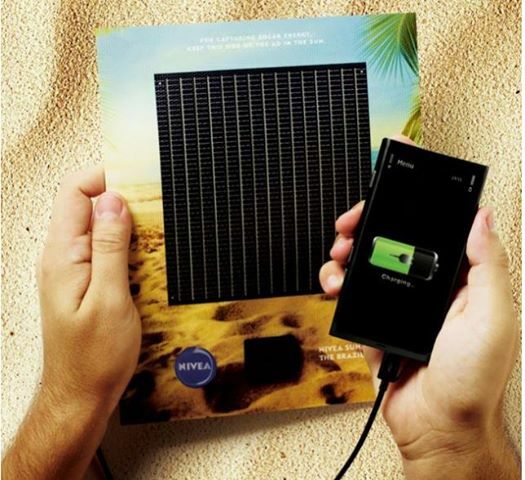 The advert, which contains a super slim solar panel allows you to charge your phone using nothing but the advert and the beautiful Brazilian sunrays. The advert boasts a slim port that allows you to connect your phone to the advert for a quick solar charge. This inventive concept was developed by a brilliant Brazilian marketer and the advert ran in the Brazilian magazine Veja Rio. The advert is mainly a novel gimmick but the hype it has generated is invaluable for Nivea. Perhaps it’s time that other marketing campaigns started using novel functionality to get a bit of buzz going about their clients’ products.